Black Friday . . . are you preparing to battle the holiday shopping crowds? With the economy in a slouch, you had better be ready to fight for the best sales. You have to be fast and first into the store. You need amazing skills to navigate parked cars, blocked aisles, any obstacle that comes between you and that steal of a deal. Can you run faster, climb higher? Perhaps you should brush up on your ninjas skills before you go into the battle of the urban ninjas? These skills have been around for a long time, but not always associated with shopping. It’s an extreme sport called Parkour. This is what might happen if you get between a free running, monkey-style shopper and his or her sale. Maybe you should take a few tips from this unique style. You can’t argue that these are some of the most awesome urban ninjas you might ever encounter, sale or no sale. Will you meet this guy in the crowd or are you this guy? Will you meet this guy in the crowded mall or are you this guy? Granted, he is not your average holiday shopper. However, he makes quick work of any urban obstacles and continues to travel smoothly on his set course. He is an urban ninja. 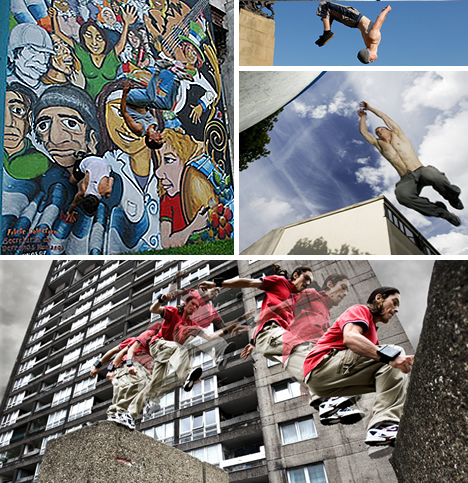 His sport is parkour, free running, an extreme combination of martial arts, gymnastics, climbing and precision jumping. What might happen with females, cell phones, and sales? What might happen with females all calling each other on their cell phones and on the hunt for the best sales? What if you saw all those parked cars in the swollen parking lots full of shoppers as less of a pain, more like play? What if walls were not a barrier, but a mere challenge to vault or wall run? Could be your shopping excursion is an excuse to practice cat leaps, tic tacs, or precision jumping to navigate the urban jungle. The sidewalks will be crowded; you know the madhouse it will be on this shopping scene. It’s important to have a plan, a route that is faster than everyone else’s. So you have walls in the way or fences between buildings? Think out of the box to beat the crowds. Need help formulating that plan? If you strapped a camera on your chest, here is what it could look like free running your way to battle the bulge of people and the crowds for the Black Friday shopping steals. Plan to swing on the clothes racks! The advertisements show some great deals, but the department stores only stock 50 items at that price. The weekend after Thanksgiving is usually a big boom and those stores put out extra clothing racks in the aisles. That doesn’t really help clear the way for you to get to the racks with the great prices on clothes. It’s important to practice your urban ninja skills moving in and out of the racks. No clothes racks handy? 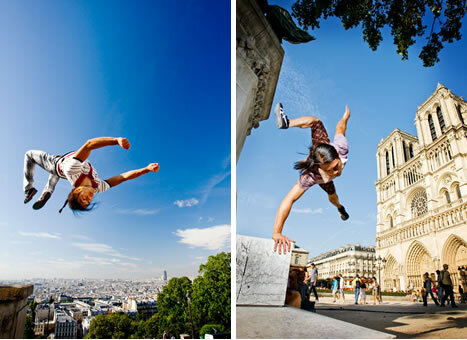 How about honing your moves through bars like these guys? This is their video response to BARbarian. That tree, the playground, there are plenty of places for you to practice your balance, your speed, your urban ninja skills in the urban jungle. Jump that wall. You might want to start practicing your Black Friday skills today as opposed to right after you’ve stuffed yourself with a Thanksgiving feast. Go over those people; take a shortcut up the tree and over them. Ladies, you know you work hard. Play hard. You never know what you might need to do in your quest for the best deals. Go forth and conquer! Females can do it better…Shopping? Oh no! How very different you might be able to plan the fastest shopping route if you cut through a playground or cut through abandoned buildings. Or perhaps jumping from pole to pole might get you the advantage? It wouldn’t hurt any of us to take a few shortcuts or to take some single-minded determination pointers from some of the greatest women free runners around. No offense, gentlemen, but females can do it better. Just shopping? Oh no! Walls, playgrounds, tires . . . reoccurring themes that you might not encounter on your way to shop. However, if you did, you could learn some wickedly sharp moves like this dude. Most of us would give this guy some space. Or he might just spin over the top of you. He has some seriously crazy-slick spinning moves. How great of a shopping excursion could you have if you had freedom from obstacles via airborne inspiration? Sascha ‘Cionn‘ Hauser of Austria looks like a normal guy in a suit. But if this dude wanted through or past you in a simple store aisle, you couldn’t stop him. 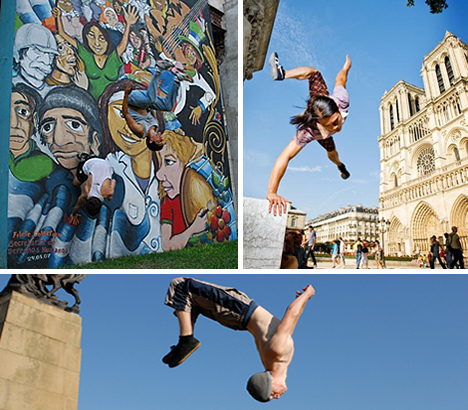 He is also known as BARbarian, a free runner known for his amazingly creative and inventive smooth moves. If you could copy a page from him, no other shopper in the world would be able to stop you or dare to get between you and that steal of a deal. Ladies…and you thought they were watching football? Ladies, if you consider yourself the shopping queen not to be topped by a mere mortal man, then consider this for a moment. You thought they were watching football or out playing poker, but what if the man in your life is practicing up, ready to give you a run for your money? Not possible? Don’t be so sure. Take a look at these dudes. A crossbreed of skills makes them capable of being thieves who would not get caught or stunt men, all courageous and determined to beat you this year in the holiday shopping crowds. It’s fairly safe to assume everyone loves a great deal, so in that Black Friday crowd you can expect a few fellow shoppers in a less-than-jolly holiday mood. In fact, some might be near a foamy-mouthed frenzy the day after Thanksgiving. It’s time to break out your urban ninja skills, but remember they can be dangerous. Gaëtan Bouillet offers a few tips on what determination to win as the best can get you. Be thankful for your health. Be thankful the worst you have to endure is shopping in the crowds from hell. Perhaps try to inject a little holiday cheer?